34 mm 18K white gold case, 7.8 mm thick, bezel set with 68 brilliant-cut diamonds (approx. 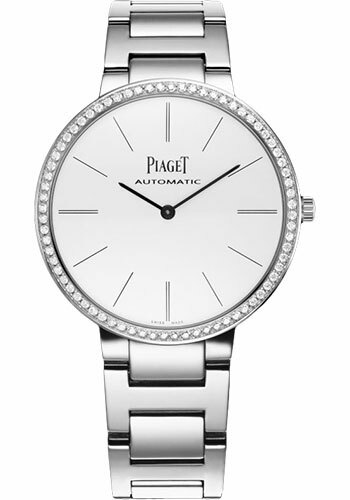 0.62 ct), white dial with its slender hands are perfectly matched by the contemporary design of its polished white gold bracelet, caliber 534P self-winding mechanical movement with hours and minutes indications, approximately 42 hours of power reserve, 18K white gold bracelet, folding clasp buckle. Water resistant to 3 atm. 34 mm 18K white gold case set with 72 brilliant-cut diamonds (approx. 0.52 ct), 6.30 mm thick, pink dial with baton hour markers, 430P hand-wound mechanical movement with minutes, hours, approximately 43 hours of power reserve, pink alligator strap, ardillon buckle. Water resistant to 3 atm.